Can you see the flounder in this picture? To flounder means ‘to struggle to move or to gain balance,’ usually helplessly and quite clumsily. Related to this, it also means ‘to speak or act in a clumsy way or with hesitation’ and, more generally, ‘to struggle’ or ‘to be in great difficulty.’ You might have also heard that a flounder is a type of flatfish mostly found at the bottom of many oceans around the world. The man waded into the river, but began to flounder as it grew deeper. The politician floundered when pressed for an answer. The student had started well, but was floundering by the end of the school year. The firm has lost its main investor and is now floundering. Flounder were swimming close to the seabed. Flounder probably has its origins in the word founder, meaning, among other things, ‘to stumble.’ Founder can also mean ‘to be in great difficulty’ and some dictionaries say that the use of flounder in this sense is mistaken, whereas other dictionaries list it among the senses of flounder without any comment. It is certainly true that native speakers do use flounder with this meaning, but if you want to be sure of being correct, you can always use founder instead. Flounder, meaning ‘to struggle to move or gain balance,’ dates back to the late 16th century. The verb is of unknown origin, but most linguists believe that it may have emerged as a variation of founder (which, as a verb, means ‘to sink or fall’ or ‘to send to the bottom,’ but has also been used figuratively meaning ‘to stumble’ since the 15th century), perhaps combined with flounce (to dash, plunge or flop). It also may have been influenced by the Dutch verb floddern (to flop about), or even other English verbs expressing similar movements (like flip or flop). It has been used figuratively since the late 16th century. The noun meaning ‘the act of floundering’ comes from the verb, and dates back to the mid-19th century. 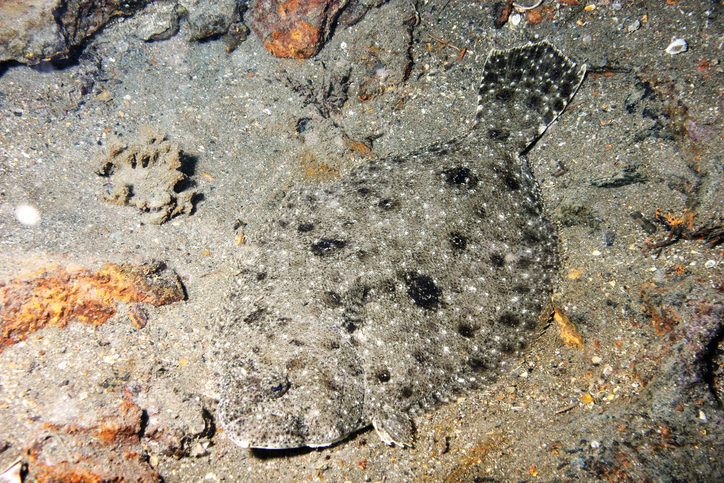 The unrelated noun flounder, meaning ‘a type of flatfish,’ is actually older. It dates back to the early 14th century, and came into English from the Anglo-French floundre and the Old North French flondre, which can be traced back to the Old Norse flydhra, from the Proto-Germanic flunthrjo and the Proto-Indo-European root plat- (to spread), a form of the PIE root pele- (flat). It is related to the Middle Low German vlundere, the Danish flynder and the Old Swedish flundra (all meaning flatfish), as well as many English words such as flat, flatter, clan, flan, plant, plantain, plate, plaza and transplant.